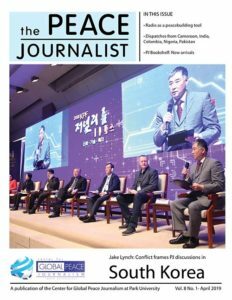 In 2019, the Center for Global Peace Journalism will continues to publish a semi-annual magazine, The Peace Journalist. In addition, the center is working on collaborative peace journalism projects in Cameroon, Northern Ireland, Uganda, and elsewhere. In 2018, director Steven Youngblood was named a U.S. Senior Subject Specialist for Peace Journalism by the U.S. State Department. In this role, was engaged in a number of PJ projects in Ethiopia from January to May, 2018. For details, see the Projects page of this site. The Peace Journalist is a semi-annual publication of the Center for Global Peace Journalism at Park University in Parkville, Missouri. The April 2019 edition features special report on the safety of journalists, as well as dispatches from peace journalists from around the world. Peace Journalism is when editors and reporters make choices that improve the prospects for peace. These choices, including how to frame stories and carefully choosing which words are used, create an atmosphere conducive to peace and supportive of peace initiatives and peacemakers, without compromising the basic principles of good journalism. (Adapted from Lynch/McGoldrick, Peace Journalism). Peace Journalism gives peacemakers a voice while making peace initiatives and non-violent solutions more visible and viable.